InventoryBase includes an optional module to add Transcription to your InventoryBase system and workflow. The built-in Transcription Service will allow you to opt in to sending your dictated audio files directly to our team, returned to you fully typed up into the InventoryBase Report Editor, ready to amend or send. To enable Transcription, click Settings on the top menu bar. 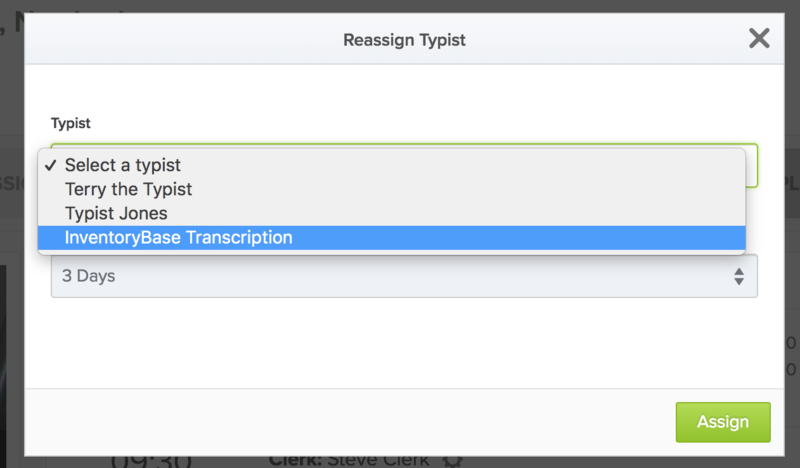 On this page you'll see an option for Transcription which you just need to toggle ON. Once that's done you'll be able to select your default turnaround time. This is the turnaround time that you'll most commonly use, but you'll still have the ability to select a different turnaround when you add a new inspection. Same Day: Within 6-12 hours of submitting the report (by evening if submitted in the morning, by the next morning if submitted in the evening). Next Day: Within 24 hours of submitting the report. 3 Days: At least 48 hours from submitting the report. On the second step of the Add Inspection page, you can choose whether or not to submit your dictated report to our Transcription Service, or your own Typist. Once you mark your report complete with the Typist assigned, your Workflow will progress to the Processing stage, where the report will be typed up and returned to you for review. You'll be notified via your Dashboard and by email when it's reached the Review stage. When in Review, you can make any changes you need to the report, upload or move photos around, and finalise the report for sharing. Click here to learn more about editing and completing reports online. Depending on the selected turnaround time, audio transcription will be billed a set rate based on the total audio minutes transcribed. To view your Transcription charges, click Settings on the top menu, then the Transcription tab. Your transcription fees will accumulate here every day and be grouped by month (up to 30 days since you were last billed). Our per-minute rate for audio transcription starts at 35p per minute. Contact us for full rates or more information.